Trade Beads with Scrimshaw by Walker Goldsmiths is dear to my Scrimshaw loving heart. Many years ago when we were first starting in this jewelry business I would create Scrimshaw pieces on Ivory that Owen would set in silver or gold. The best material to scrim on is fossil mastodon or fossil walrus tusk ivory and these are legal. I still have a very few pieces leftover from those days. When I came upon this Scrimshaw bracelet signed by Willie Topkok I researched him determined to use it somehow in a trade bead necklace and found that he is a wonderful artist in many Inupiaq traditional techniques. What is Scrimshaw? It really is one of the most important truly American folk arts. It originated with whalers in the 1600’s using their spare time and whale teeth and bones to etch upon with sharp tools, then blackening the surface so the etching shows up well. It started out with primarily a nautical focus, but was used to portray and decorate anything made of Ivory or bone. Willie Topkok is an established Inupiaq artist, who scrimshaws beautifully. He has a unique style that really appeals to me. 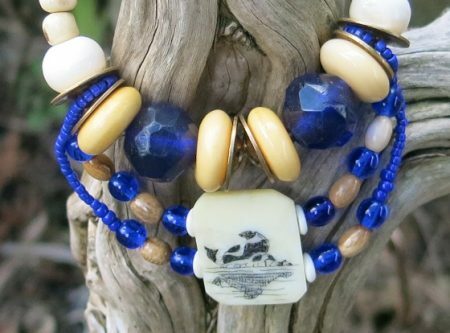 When I found a bracelet that had segments showing scenes from Inupiaq life I just had to share and use the scenes scrimshawed on Fossil Walrus Tusk Ivory with Fossil Walrus Bone and Trade Beads: Blue Russians, Venetian and Czech Cobalts. This one featured here is a beautifully done Scrimshaw scene of a Sea Lion on an ice flow. 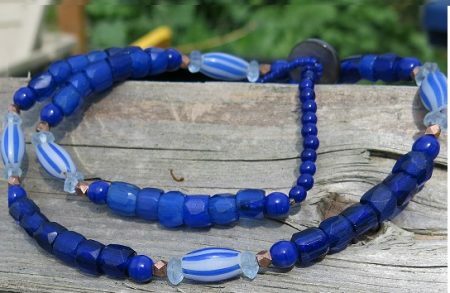 The 2 large Cobalt beads are Bohemian faceted beads from the early 1800’s. The beautiful Blue Russians just had to be incorporated in this necklace for historical reasons. The Russians used these cobalt hand faceted beads as payment to the natives on the Alaska coast for Sea Otter pelts in the 1600’s. The natives used them on their attire and further traded them to other people for goods. They were and still are in high demand. Of course, using Fossil Walrus Bone and Ivory was a must along with the beautiful colors of ancient Ice Age Mastodon Ivory beads. Czech Cobalts are gorgeous and always used well to space and protect the other beads. Fossil Walrus Ivory Scrimshaw by Willie Topkok, Fossilized Walrus Bone, Trade Beads: Mastodon Ivory beads, Blue Russians, Venetian and Czech Cobalts. Crazy ’bout them Reds – Trade Bead Necklace by Janet Walker at Walker Goldsmiths is a show stopper. I’ve been making this stunner for a couple of years now and it never fails to please. Something about those Reds, alright! Guaranteed to cheer up anyone, especially welcome on a cloudy day, and a great addition to a work-a-day wardrobe. These Antique Trade Beads all date to pre-1850’s. The little red Czechs are newer but the main beauties are steeped in history. The two Pressed Venetian Monochromes are ancient red glass beads made with the earliest technique for shaping glass beads; a pretty direct technique of pressing hot glass in a metal mold that requires a pin pressed down in the center to create the hole. The beads are knocked out of the mold then tumbled and shaken to break off any spurs. You can see the edges are rough and that indicates early mold techniques. Sometimes the beads are tumbled with high heat to “polish” them and that takes off some of the roughness, but the edges do indicate their age. Lots of opaque Red Padres in this necklace too. The colors of red, white and sky blue were the most desirable of the glass Padre beads offered by Traders to the SW American Natives. I can understand that because of their solid beauty. They are all individually made by winding hot glass around a wire. This technique really gives them all a one-of-a-kind appearance if you look closely. I really like Padres because of the technique which makes them seem to have a soul. The makers of festival clothing and jewelry knew that these Padres would bring elegance to their creations. The name of those striped red and white glass beads is Dutch Gooseberries, really! They’re originally made in Amsterdam from the 1400’s on in colors of pale greenish yellow, reds and blues all with the white added stripes. If you’ve ever seen a real Gooseberry they do have a series of stripes all around them, are pretty translucent in the pale colors, but as they ripen from whitish green to red to blue you may see the resemblance. I know it’s a stretch! The largest Cranberry colored glass beads are called just that, Cranberries. They’re interesting because not only are they very old, dating back to the 1500’s, but they were made when red glass was colored with Gold Chloride by the Venetians. It turned out to be so expensive to do it that way that they started coating other colors like green or white glass with a thin coat of red to keep the cost down and be more saleable. The faceted red glass beads are Venetian made also. The birth of the Hudson’s Bay White Hearts come in here. These are the red glass beads with the white interiors that were in such demand by the North American Natives and the African tribes. These beads were made in so many sizes; from teeny seed size to very large, from cranberry color to bright red. 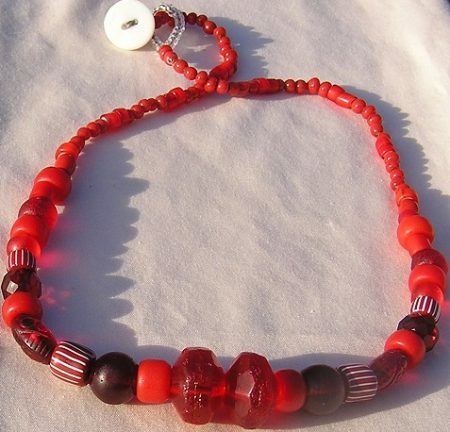 There’s also some beautiful Red Coral beads in this necklace and a couple of ancient Venetian Red Pressed Glass beads. Crazy ‘Bout Them Reds, Trade Bead Necklace by Janet Walker. $250 Earrings to match available also. Donna saw the Two Paths Ring here on our website and got in contact with us at Walker Goldsmiths to make one similar for her. She had been looking at it for sometime and finally decided to just do it for herself. Always a good decision for us girls! We talked about what metal to make it out of; what is most wearable, if there are any allergy concerns, what color is most suitable to her, as she wanted to wear it all the time. 14kt White Gold was the metal of choice and we went ahead carving the wax then to casting and finishing. The Two Paths ring turned out beautiful. This is a beautiful story that I needed to hear! Walker Goldsmiths is especially grateful for the opportunity to be a part of providing Donna with this symbol of her determination and strong spirit. It was very personally touching to me. Thank you, Donna, for this lovely Two Paths Ring project. This Custom Surfer Ring with a Doberman by Walker Goldsmiths is a personalized variation of our Surfer Rings. We are having a lot of fun designing Surfer Rings and meeting people who love the sea and being on and around it. That’s basically us! Owen and I don’t surf but many of our kids do and we understand the emotional appeal and pull of the sea. Living on the Pacific NW Coast we have spent many a year on fishing boats and enjoying water sports whether it’s salt or fresh water. It’s always been a whole family experience and we know that puppy dogs are part of families. Danielle got in contact with us asking for a Surfer Story Ring with palm trees and crashing roller waves and their Dobie puppy dog featured on it. No problem! 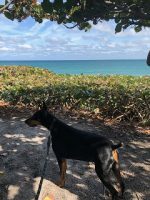 She specified, “I am looking to have the Dobie cropped and docked (pointy ears and short tail).” This was to be an anniversary surprise for her husband so she had to be sneaky and send us pictures of their pup so I could get a good idea of his shape to carve on the ring. I carved it out and sent pictures to Danielle as we went along so she could approve before we went to casting. Owen lost wax cast it and finished it to perfection. 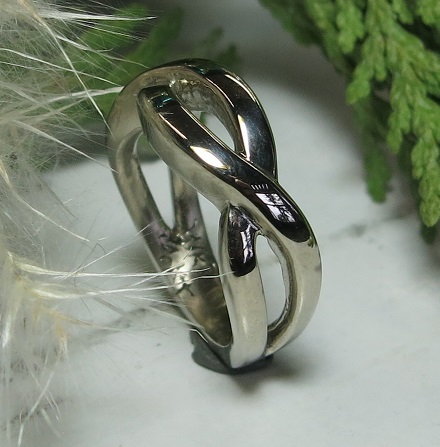 The fact that it was cast in Sterling Silver allowed us to oxidize it so the 3-D carving is obvious and perfect for this very personal ring. The appeal of Story rings is the ability to portray a personal view that you want to remember or celebrate. It’s fun for Walker Goldsmiths to be involved in surprises like this, a real perk of the job! 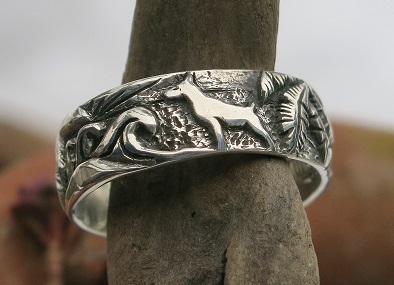 Thank you, Danielle, for letting us do this Custom Surfer Story Ring with a Doberman for your Sweetheart. This is a wonderful Story Ring with so much meaning! I carved the wax, checking with Leslie all along the way. We wanted to get it exactly right. Owen lost wax cast it in 14kt white gold and inlaid the 14kt yellow gold triangle in the ring. Leslie was very smart and sent us a bunch of old jewelry to recycle to go towards the cost; important as they start out together on this new adventure. Thank you, Leslie and David Campbell, for letting Walker Goldsmiths have a part in creating this special Custom Pounamu Wedding Ring. The meaning, history, story, future and the design are all exceptionally beautiful! Rainy Day Blues Trade Bead Necklace and Earring Set by Walker Goldsmiths is always fun to wear. These shades of blue Trade Beads are bright and sparkly. They are always attractive, kind of Bohemian yet historical and semi formal. Their history is fascinating. The center focus bead is an 1800’s Bavarian Cobalt hand faceted by Bavarian Cottage families. More than 200 yrs ago or earlier a family of glass workers made or bought the rough glass tubes beads, cut them into beads then hand ground the facets and polished the individual beads for resale to traders. The glass technicians lay face down on a bench and pressed the beads onto a stone grinding wheel, with water running over the stone to keep the dust down they rotated the beads individually to create the facets on the beads. These early glass faceted beads would have been used in the African Trade and North American Fur Trade market, and can still be found today for sale by Bead Traders. 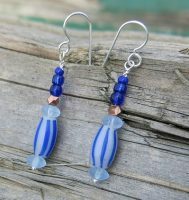 The bright Cobalt Czechs are spacers to protect the antique beads. The sky blue Padres have a different and unique history too. Padre beads are wound, opaque, light blue glass beads originally from Venice. Also reproduced in China and so many other places because their production technique is relatively simple. The Fur Trapper site gives wonderful info for further study. “Through Spanish and Russian traders, Padre beads spread rapidly into the Southwest and Northwest. In 1778, English explorer Captain James Cook made several references to the effect it was difficult to obtain supplies and furs from the Pacific Coast Indians without this particular blue bead. 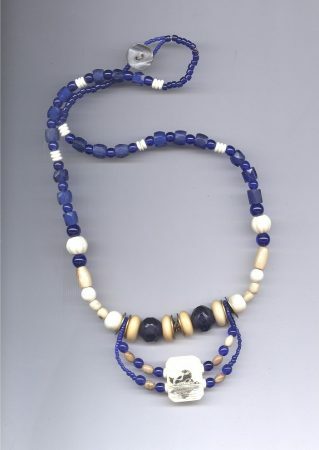 Padre beads were made in a variety of colors but blue and white were the most sought after by the Northwest Indians”. The name “Padres” come from the use by Jesuit priests who rewarded natives for memorizing prayers and scriptures with these beads as payment. 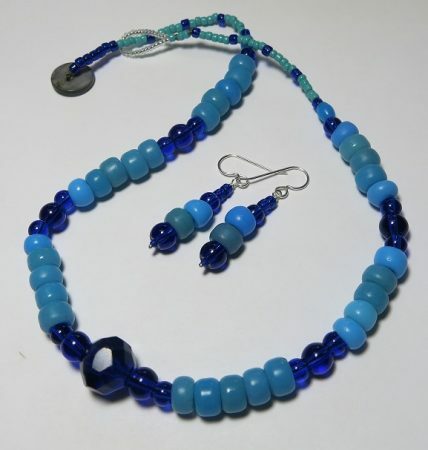 Rainy Day Blues Trade Bead Necklace and Earring Set by Walker Goldsmiths. Priced at $ 275, free S&H in the US. Grandmother’s Diamond Solitaire Ring was the result of Walker Goldsmiths working with Leigh Ann who wanted to recreate a family heirloom. 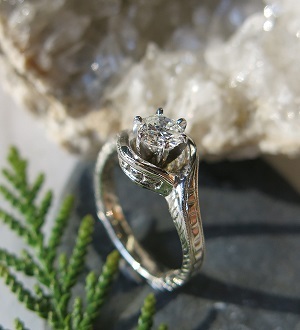 Leigh Ann sent us her grandmother’s 14kt white gold filigree ring to see if we could fix it and replace the diamond. Sadly we had to tell her that it was so far beyond repair that it was impossible to do as she was hoping. We did have a suggestion that could possibly work; take the gold of the antique ring, carve a wax of a ring she would like and cast grandma’s gold into the new custom ring. Recycling was the answer. Leigh Ann like this idea. We talked a bit and she found a ring on our website that appealed to her, so I went ahead carving a wax and Owen shopped for a .50 ct diamond to put into the ring. 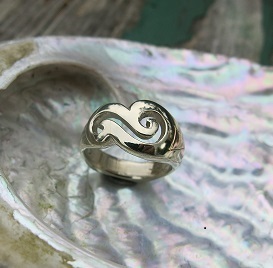 After lost wax casting the ring in 14kt white gold, Owen handcarved filigree-like patterns on the gold. He then provided a 6 prong Platinum crown for the .50 ct. diamond. Platinum crowns just don’t wear out and they almost never have to be retipped. They are at least a 100 times more durable than white gold. The end result was perfect. Now Leigh Ann had a family heirloom with memories, yet a new, strong, Grandmother’s Diamond Solitaire Ring to last for decades and to continue to be an heirloom. Thank you for hunting Walker Goldsmiths down, Leigh Ann. It was a pleasure making this for you! Trade Beads …Salish Sea with White Caps, Necklace and Earrings set was a joy to make here at Walker Goldsmiths. Creating this trade bead necklace design had me remembering my childhood chasing around in little speedboats on the Salish Sea. I grew up on the Tulalip Reservation in Port Susan north of Everett, WA, in the pacific northwest US, and we kids spent a lot of time on the water. We also spent a lot of our summer time doing chores and odd jobs just to buy gas for our little motors so we could zip around with our friends coming and going to the best clam beds, collecting crabs from the crab traps we set, and fishing for anything that would bite our bait. Snooping around all the ins and outs of the bay, hanging out around and under the docks and keeping an eye out for any lost flotsam and jetsam that comes and goes with the tides every day was always interesting. With all this preoccupation with our destinations we had to always keep an eye out for the changes in the tides and especially what the winds and the water were up to. Little ripples could change to mighty waves in the blink of an eye and a little “chop” could turn into “white caps” just as fast. Some choppy sea could be very much fun to run our little boats with, but we had to be watchful. These beautiful antique Russian Blue, individually hand faceted Trade Beads, circa 1700’s and possibly earlier, represent the Salish Sea. I always put Czech Cobalt glass beads on with the Russians to protect them and facilitate a lovely grace and flow of the necklace. The Venetian Chevron “Stripers” reminded me of the “white caps” rolling and bouncing along the tops of the waves. The little German pressed glass spacers and the faceted Copper beads I just had to put in to represent the sunshine glinting off the waves on a beautiful sunny July day. Ah, Summertime! Trade Beads …Salish Sea with White Caps, Necklace and Earrings set by Walker Goldsmiths is priced at $275. S&H free in the USA. This Aleut Sunset Trade Bead Necklace by Walker Goldsmiths is a beautiful collection of trade beads reminiscent of a late summer sunset in the Aleutian Islands. The Aleutians are amazing islands located off the southern coast of Alaska. Walker Goldsmiths has a collection of fossil Walrus Ivory that I love to put into Trade Bead Necklaces. 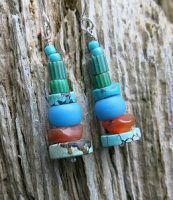 They blend themselves so well with the trade beads in the colors and patina that these fossil pieces attain. Also they blend with the history of the traded beads in the area of the North Pacific where these fossil bits are found. The story goes that native Aleut kids don’t have summer jobs mowing lawns in the Aleutian Islands so they scramble around the beaches and eroded streams looking for these fossils to sell to traders. I love it! Many of these pieces of Fossil ivory are broken bits and parts of sled runners, snow knives, harpoon points and other tools, all having that man-shaped aura, also fabulous colors from being buried in the earth for thousands of years. I don’t know what this original ivory piece was used for, but the piece came with the hole drilled in it and it has the appearance of primitive drilling techniques. It could possibly be a fishing line weight; the material is definitely easier to drill through than stone. I like to call it a toggle because that too is a possibility. Toggles are easier to unhook to access stuff in packs than fussing with a knot. I use easy to manipulate, yet strong and secure, black lip pearl shell buttons as toggles instead of metal clasps to fasten my necklaces because they are so much more convenient. 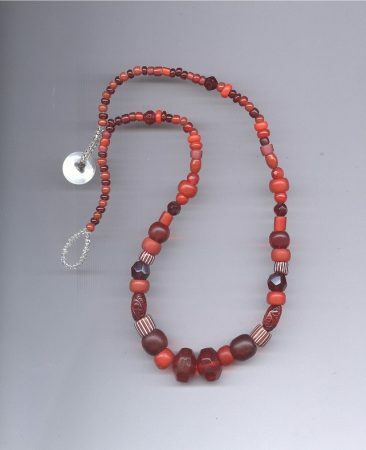 The specific beads used in this necklace to create this blend of colors are orangey Carnelians in chunks and round beads. The opaque tabular turquoise beads are very rare glass Venetian Fancies from the 1800’s to remind me of the clouds often on the horizon at sunset. I choose various shades of Turquoise beads, chunks and heshi along with the wonderful sky blue Padres to simulate the turquoise-blue skies of the Summer Sunset. A smattering of shell, bone, green chevrons and jasper are the flavors of the beach surrounding these islands. I make Earrings to match this necklace if you’d like that. The price for this Aleut Sunset Trade Bead Necklace, including Earrings is $275, free S&H in USA.